Endoscopic retrograde cholangiopancreatography, or ERCP, is a medical procedure used to diagnose and treat certain afflictions of the liver, pancreas, and gallbladder. ERCP is rarely recommended solely as a diagnostic procedure. Usually ERCP is reserved for medical situations in which it is suspected that immediate action can be taken. 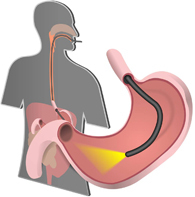 During an ERCP, a lighted endoscope is inserted into the patient’s mouth and is gently moved down the throat. The endoscope is moved through the esophagus, the stomach, then into the duodenum. The modern endoscope is equipped with a tiny chip that sends video images to a computer screen being viewed by doctors. When the endoscope reaches the duodenum, which is the top part of the small intestine, a dye is cycled into the hollow tube in the center. X-rays are taken, and the dye highlights certain obstructions and other issues. The dual approach used in ERCP can identify many issues that would not show up on other kinds of tests, such as MRIs and ultrasounds. The tube that has been inserted into the patient may also be used to perform certain procedures, such as biopsies and insertion of stents. A doctor will usually provide written instructions detailing what must be done to prepare for an ERCP. The upper GI tract, which the endoscope will pass through, must be completely empty. To accomplish this, there must be no eating or drinking for at least eight hours prior to the procedure. Smoking and chewing gum are also prohibited. Many types of medications and dietary supplements will interfere with the procedure. Patients will often be asked to temporarily refrain from taking these, sometimes both before and after the procedure. A sedative is used in the procedure, so patients are also asked to make preparations for a ride home after the procedure. Patients should allow about 24 hours before attempting to drive or operate heavy machinery. This allows enough time for the sedative to completely wear off. Patients should also discuss any allergies with their doctor prior to the procedure, especially shellfish allergies. The dye used during the ERCP contains iodine, which may have the same effect as shellfish. Patients are typically given about an hour to rest immediately after an ERCP is completed. Anesthesia affects memory, so patients will often have conversations with staff that they will not remember later. During this hour, the patient is observed to ensure that there are no uncommon side effects or problems from the procedure. The results of many tests conducted during an ERCP are available right away. However, results of biopsies may be available a few days after the ERCP procedure. Patients are advised to take 24 hours to rest, as they may feel sleepy from the anesthesia. Patients can typically resume normal activity and diet the day following the ERCP procedure. “ERCP.” Medline Plus.U.S. National Library of Medicine, 22 Mar 2013. Web. 18 Jun 2013. <http://www.nlm.nih.gov/medlineplus/ency/article/007479.htm>. “ERCP.” National Digestive Diseases Information Clearinghouse. U.S. Department of Health and Human Services, 29 Jun 2012. Web. 18 Jun 2013. <http://digestive.niddk.nih.gov/ddiseases/pubs/ercp/?control=Tools>. Marks, Jay. “ERCP.” MedicineNet.com. WebMD, 24 September 2009. Web. 18 Jun 2013. <http://www.medicinenet.com/ercp/page2.htm>.